A wisg gwrlid o sgarlad. 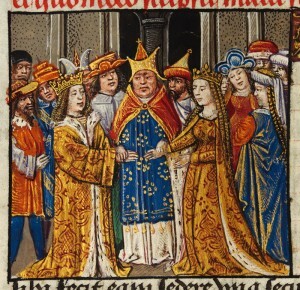 Fashion was just as important in the Middle Ages as it is today. The nobility and gentry chose to wear spectacular and expensive items of clothing to display their status. Indeed, their interest in textiles and material objects such as striking accessories to complete their outfits was fast increasing during the fifteenth century. The poems are full of references to costumes. Giving items of clothing as gifts to the poets in exchange for their praise had been a popular practice in Wales for centuries. A gift such as a mantle or a cloak was valuable enough to recompense the poet for his services. Guto’r Glyn received an Irish mantle called a ffaling and two purses from his patrons which he describes in great detail. Did Guto’r Glyn have a particular interest in fashionable clothing? In one of the satirical poems exchanged between him and Llywelyn ap Gutun (poem 65.39-40), Guto accuses his friend of wanting to see him drowned near Malltraeth because he covets his mantle!